What Is a Hammer Strength Chest Press? 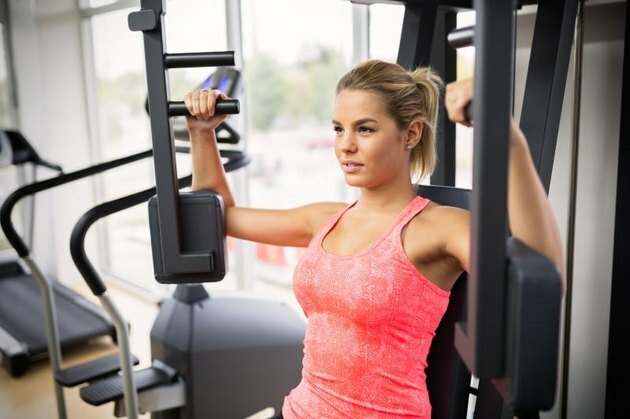 Good news: The Hammer Strength chest press you've heard whispered about in the gym doesn't actually involve any hammers. Not even a little tack hammer. 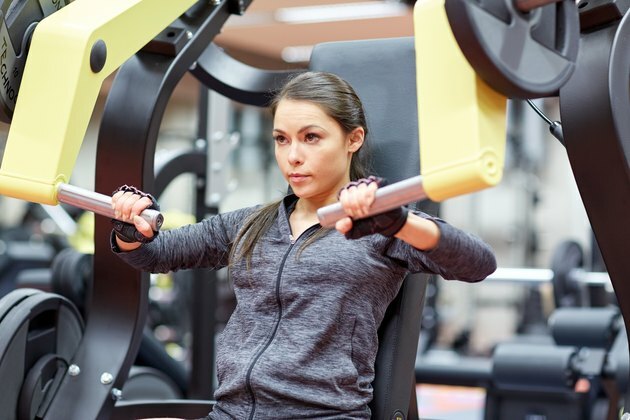 It does involve exercise equipment, though, because a Hammer Strength chest press is a chest press that's done on a weight machine from Life Fitness called the Hammer Strength. You do it with much the same motion as you would a dumbbell chest press or a machine chest press — it's the machine itself that makes this exercise a little different. If you know the incline chest press, or even the dumbbell bench press, you'll be pretty comfy with a Hammer Strength chest press. Start with your feet flat on the ground and your back flat against the inclined seat. Take a wide grip on the handles to focus on the outer chest, or a closer grip to work the inner chest more. Keep your elbows tucked (not flared) and raise the weight above your head until your elbows are just slightly bent, then return to the starting position and repeat. Paired with a few other workouts on chest day, six sets of 10 reps on the Hammer Strength machine makes for a balanced, pec-friendly workout. Since you're performing the same basic motion as a lever incline chest press, you're targeting the pecs with a Hammer Strength chest press. You're also engaging the triceps, anterior deltoids and biceps, which makes this a pretty versatile addition to your upper-body day routine. In addition to the basics, the Hammer Strength machine itself differentiates this press from a standard machine chest press. Hammer's machines use free weight plates rather than stacked weights, basically hybridizing a free weight and machine workout. "In some circumstances, depending on the machine, I think Hammer Strength is better than free weights. [...] You can really isolate your muscles better with Hammer Strength Machines, and control your movement a little better." Are you a Hammer Strength fan, or do you prefer a good old-fashioned dumbbell chest press? Have a different preference altogether? Hammer Strength or not, machines can definitely cause opinions to fly in the gym, so let yours fly with pride in the comments below. Can You Do Push-Ups the Day After a Chest Workout?